How to watch Cowboys & Aliens (2011) on Netflix Argentina! 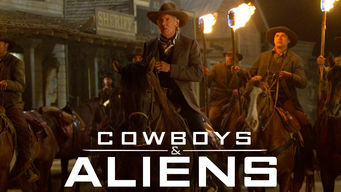 Yes, Cowboys & Aliens is now available on Argentine Netflix. It arrived for online streaming on October 7, 2017. We'll keep checking Netflix Argentina for Cowboys & Aliens, and this page will be updated with any changes. Amnesiac gunslinger Jake Lonergan stumbles into the Wild West town of Absolution, where he's confronted by terrifying aliens. Ah, the Wild West. Where men were men, women were women, and space invaders were hell-bent on killing them all.